The cooking magazine adventure continues! Today we pick apart a new magazine called "Eating Well." It is new to me anyway. I got a copy of it a few months ago from a friend of a friend who works at a store. The cover was off it. I guess that is what happens when a magazine does not sell. They rip the covers off. Anyway I got a cover-less issue. And I loved it! This was the issue from last November, or whenever. I made about 15 recipes from the issue, which was a lot, considering it is a skinny magazine and I was very busy with my book on Leonard Pennario. They had a great story on eggplant and I made something like 5 out of 6 of the recipes. And I made two chicken recipes and a soup. This is great, I thought! So a few weeks ago I was thinking about that and I subscribed. It had been only two months but in those two months the magazine had done a redesign. I am telling you right now, magazines are sinking, and that is why they keep idiotically reinventing themselves. It is a desperation. 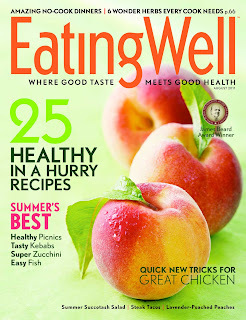 Now Eating Well is 10 pages skinnier. And it has, on its cover, "41 Recipes." That is fewer than my last issue! And two of the recipes do not count because it is "for two." They have, just so you know what I mean, Chicken Shawarma For Two. All the "for two" recipe is, is a box where they say, "To cook for two, halve all the ingredients." Then they list it as a separate recipe! Is that the dumbest thing or what? Fie! Fie on them and on their tables. And on their salt and pepper shakers. Also I do not care about "tips," you know? Martha Stewart Everyday Food was guilty of that this month too. The cover promises: "Our best tips." Who cares about tips? Just give me recipes. Not tips, not lectures on sustainable fish or green this or that which, I do not believe in global warming anyway. Just recipes. Why is that so hard to understand? Fie on Eating Well. Fie. All the same I did make the Chicken Shawarma, not for two, and it came out wonderful. So all is not lost. Just 90 percent is lost. I am terrible when it comes to cooking magazines. I am so hard to please!